This is a basic, classic Pi Zero enclosure with a black base and a clear top. 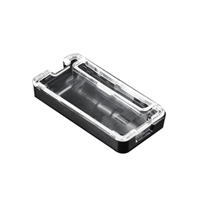 The case is as minimal as it gets, coming in just two pieces of polycarbonate that snap snugly together. This case will keep your Pi Zero/ Zero Wireless safe and secure while also looking super sleek. You can use all of the connectors on the edges of the Pi: mini HDMI, microSD slot, microUSB power, and microUSB port. There's also a cut out to allow a 2x20-pin header to be soldered onto the Pi Zero. 2.8" x 1.4" x 0.5"